Occupy Jupiter! Get behind our protest movement! NO MASS JUSTICE, NO PLANETARY PEACE! Comrades, the solar system is unfair! Why do some planets, like Jupiter, have so much mass and others, like Mercury, have so little? Is it because Mercury is mostly black? Join the #OCCUPY JUPITER movement and demand a more equal solar system! Not just mass, but MOONS as well! Jupiter exploits other planets by opulently displaying more and bigger moons. Such flashes of inequality can be seen with the naked eye. This cannot go unobserved any longer. It's absolutely indecent! We should have the government Sun redistribute the mass equally. Come to think of it, our sun is quite small compared to the other stars in the galaxy. The black hole in the middle should redistribute celestial mass as well. But our black hole isn't equal to all the other black holes either! We have to occupy the entire universe! But how can we be sure our universe is equal to all the other universes? We have to occupy the entire multiverse! BUT WAIT! WHAT ABOUT OTHER DIMENSIONS?! Comrades, we have a lot of slacking off lazing about loafing around not working occupying to do. #OccupyEarth is so 2010! 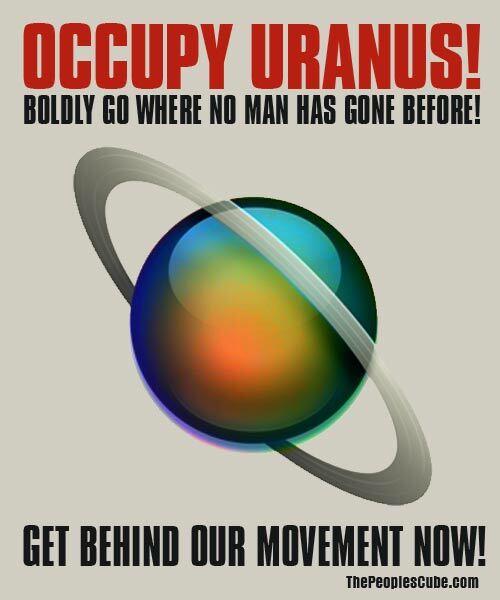 Let's go into space, where no man has gone before - OCCUPY URANUS! Growing disparity among planets raises moral questions! Big Astronomy doesn't want you to know that big planets are getting bigger and small planets are getting smaller! I'm really proud of the work our General Secretary Alisa Seleznyova has been doing in relocating capitalist pigs to Jupiter and be put to use in works camps of some sort. Meanwhile, Back at the Revolucion, is Bonnie Fwank "heading" Occupy Uranus? There could be quite the "movement" that I want no part of. You make a good point, comrade, but these astronomical terms were created by our like-minded friends in academia, so they are clearly not racist. Now, the tea baggers obviously prefer white tea for their party. It's clear they shun other teas of color, such as green or black. Now that's racist! Comrade Moore has taken the lead on this one, for now. You have outdone yourself ! Glory to The Party for your visualization of the infinity that is liberal socialism. As for you, help your self to another beet... or even an onion, for your efforts. Today, Uranus. Tomorrow, the Galaxy! Make the gas giants pay their fair share! I know I beat "Michael Moore is fat" jokes a little too much, but if we are redistributed gravity, wouldn't he alone provide a little too much? Jon Corzine, A HERO of the Occupy Wall St. Movement!